• Squirrels fit into three general groups: tree squirrels, ground squirrels, and flying squirrels, all of which are represented in Oregon and Washington. • Squirrels eat a wide variety of plants, nuts, seeds, conifer cones, fruits, fungi, and green vegetation. • In most species, parental care is the sole responsibility of the female squirrel. • Most squirrels have a spring and a fall litter. Litter sizes range from one or two to as many as nine or more. • In all squirrels, gestation period is short, being somewhere between 3 and 6 weeks. 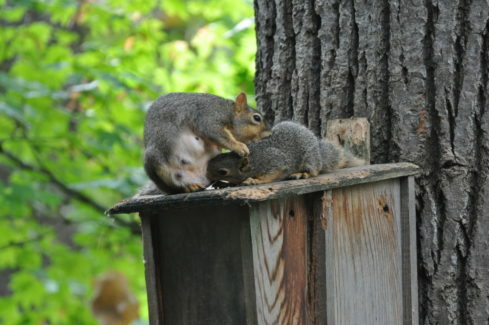 • Newly born squirrels are helpless and will usually be weaned by 10 weeks old. • Young squirrels may venture out of the nest at 45 days old, but many remain near their mother and often share her nest even after being weaned. • Many squirrels molt twice a year, sporting a lighter coat in summer than in winter. • Tree squirrels use their tails as a balance, as a rudder, as a flag to communicate social signals and as a blanket.